AN EXCLUSION zone has been declared in the Bluewater area due to extensive flooding. The declaration came into effect about 4pm on Wednesday and encompasses the area from Purono Parkway, Blue Hills to the west and Varrall Rd to the north. A police spokesman said the official exclusion zone gives officers power to arrest anyone who does not corporate with warnings to avoid the area. 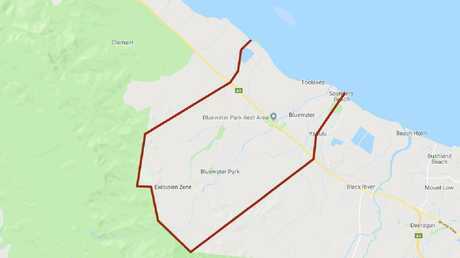 Police declare exclusion zone under Public Safety Preservation Act for areas in Bluewater encompassing Purono Parkway, Blue Hills and Verrall Rd. Nearly two dozen residents of Bluewater have been evacuated as emergency crews mount a flood rescue effort unseen in Townsville for many years. Queensland Fire and Rescue Assistant Commissioner for the Northern Region David Hermann said the situation at Forestry Rd and Toolakea Beach Rd remains "fluid". As of 4pm crews were continuing to do a second check of homes to ensure no one had been left behind. "It's varying, but it's upwards of half a metre of water in some properties on average, depending on the lay of the land half a metre or maybe a bit more," Mr Hermann said. "At some points the water was travelling at about 15 knots to 20 knots and where [the area] widened it slowed right down. "My staff are telling me that this is quite a significant event that hasn't been seen at this scale at that location for quite a number of years." Mr Hermann said there were 20 swift water rescue specialists on hand at the Bluewater incident who are working in teams of four with the assistance of SES and Water Police. There are between four and five rescue boats, including the inflatable police boat, ready to rescue residents. The flooding is expected to last for a number of days. "We implore the community to listen to weather reports, to have a plan in place if they become stranded and don't drive in flood water," Mr Hermann said. The response to the severe flooding at Bluewater is being co-ordinated by the Townsville District Disaster Management Group. 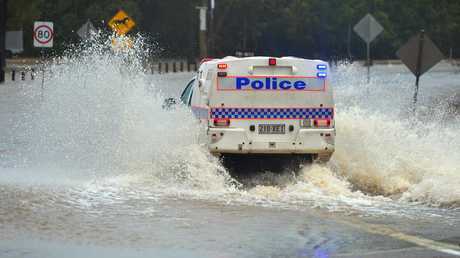 A Queensland Police spokesman said the "very heavy, intense rainfall" across the last several hours has resulted in the inundation of properties along Forestry Rd. "Queensland Fire and Emergency Services swiftwater rescue crews and Water Police have assisted in the evacuation of several properties, and the response remains ongoing," he said. "Crews are also conducting checks of neighbouring properties." The Bureau of Meteorology advises that the intense rainfall will continue throughout the afternoon. The Bruce Highway is also cut on the northern side of Bluewater Creek. For public safety reasons, Ergon Energy has cut power at Bluewater, where fire crews are involved in swift water rescues. A total of 433 customers are affected by the emergency outage. An Ergon spokeswoman said crews are on standby to restore power when it is safe to do so. A MAJOR flash flooding incident at Bluewater is under way with residents understood to be trapped in their homes and schools forced to shut as emergency services scramble to respond. It is understood water levels are rising rapidly in the area, with police, firefighters and ambulance services en route from both the north and the south. The Bruce Highway remains open however police are directing traffic flows. Residents have been advised to avoid travel into the area. The Townsville-based Queensland Government Air Rescue helicopter has been tasked to find and help three people believed trapped in their home in rising floodwaters near Bluewater. QGAir Townsville base manager Greg Huppatz told the Bulletin the helicopter was tasked by Queensland Police from Townsville Airport about 1pm. "We have been tasked to locate and assist three people trapped in their home in rising flood waters in the vicinity of Forestry Rd," he said. Police earlier rescued a pregnant woman from Forestry Rd and have taken her to Townsville Hospital. 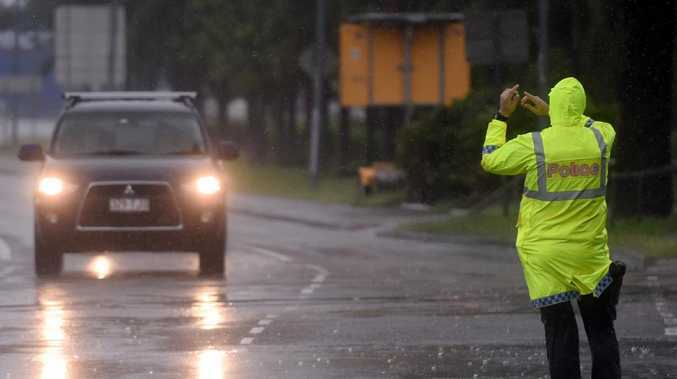 Queensland Police have confirmed no schools nor homes have been formally evacuated due to the flooding incident in Bluewater. However residents in the area are understood to be voluntarily leaving their homes to head to safer ground. One man has been rescued from Forestry Road, water police remain on scene as well to assess another few homes for potential rescues. Bluewater homes are understood to be under a foot of water as of noon today. There are reports of at least two people and their dog being unable to leave their house due to rising floodwaters. Reports have emerged of sheds and structures, shipping containers and tractors floating past houses as floodwaters continue to rise. Bluewater Community Association treasurer Darla Astrill said flash flooding was hitting Forestry Road. "I just spoke to lady on Forestry Road whose neighbour's car just floated away, someone else has lost a shed and all the houses along the creek are starting to go under," Ms Astrill said. "Someone else has just reported a tractor going down the river also so it's just devastating." She anticipated the Bluewater community centre would open tonight for stranded residents. A pregnant woman who is about to give birth has just been rescued by police officers after being trapped by Bluewater's flash flooding. It is understood the woman, who lives on Forestry Rd, has been loaded into a police car and will be rushed to Townsville hospital. Parents with students at Bluewater State School have been urged to collect their children if possible. Bluewater SS principal Trevor Buchanan told the Bulletin most of the students had now been picked up. 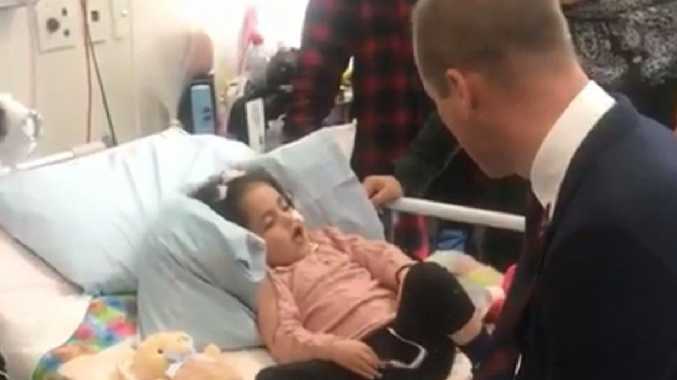 "Our students are nice and safe at this point in time, we're just going through the process where parents are being urged to collect their children where possible," Mr Buchanan said. "The kids who are still here are safe, staff members are with them and the school is nice and dry with no damage. "We're aware of localised flooding in the area, and we're monitoring the situation along with emergency crews and police." Water Police and swift water rescue crews have been deployed to the area. Emergency crews from Ingham have also been called to assist, with CQ Rescue put on standby. Parents with students at St Clare's Catholic School and St Anthony's Catholic College who live in affected areas have also been warned to consider collecting their children if it is safe to do so. 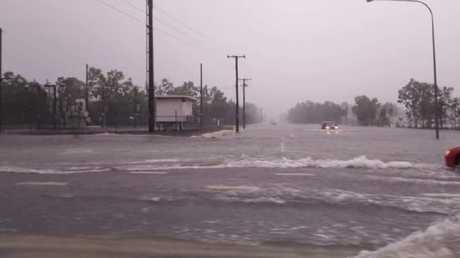 Giru State School and Woodstock State School to Townsville's south remain closed. Rollingstone State School has also contacted parents to collect students and will close once all students have been picked up. Meanwhile residents at Giru have been urged to act now and evacuate or make necessary preparations as the Haughton River continue to rise. The Bureau of Meteorology's current models predict that Haughton River will peak at 3 metres later today.